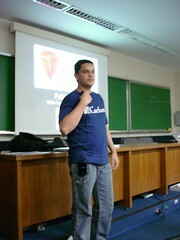 It was a great time last weekend, spending part of my holiday at RejectConf SP’07 in Brazil, “our first relevant conference”, as said by Fabio Akita. The lectures were really great and the coffee-break (thanks Caelum) really came on the right time. During his RSpec talk, Danilo Sato created a web application to rate the presentations. As you can see there, the coffee-break shined. It was a pleasure to meet new people from our community and to see old friends. I talked about the most fantastic project nowadays and fortunately people seemed very interested about it. Get the slides. 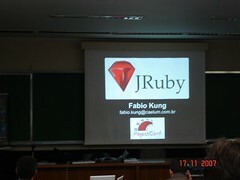 One week before (10 Nov 2007), I was at Conexao Java 2007 and gave a mini-course (~6 hours) about JSF, Ajax and Richfaces. Great time too, thanks to all attendees! You can get the slides and code here. More info at the Caelum Blog (pt-BR). And I thghout I was the sensible one. Thanks for setting me straight.